James Walker does not work for, consult, own shares in or receive funding from any company or organization that would benefit from this article, and has disclosed no relevant affiliations beyond their academic appointment. In December 2011, when the Los Angeles Angels of Anaheim and Texas Rangers signed away their local television rights for about $3 billion apiece, the sport media heralded a new record for local television rights fees. Accounting for roughly 43% of MLB’s $8 billion haul in 2014, media revenues have made the players rich and the owners even richer. Today, the idea that a team would ban its games from being broadcast is unthinkable, so ingrained are TV and radio contracts in the marketing and business practices of the sport. But in 1921, when radios first began making their way into American homes, a number of baseball team owners weren’t quite sure what to make of the emerging technology. In fact, the owners were sharply divided over whether or not broadcasting games on the radio would benefit or deeply damage revenues. A 20-year battle among owners would ensue. While radio’s popularity couldn’t be denied, half of baseball’s barons – mostly located along the East Coast – viewed radio as a fifth estate thief, robbing them of paying customers at the gate. And in this era, the gate was everything. But other owners, led by Chicago Cubs owner William Wrigley and located primarily in the Midwest, saw radio as a promotional machine that would sell baseball to women and, more importantly, children – the next generation of paying fans. Each group had sound reasons for its stance. Squeezed along the Atlantic coast, the eastern franchises drew most paying customers from dense, urban populations who used streetcars and subways to get to the ballparks. These teams worried that radio might keep some of those fans at home. Midwestern owners, generally located in smaller cities, depended more on out-of town weekend and holiday guests, who arrived by car and bus. In their minds, baseball broadcasts would reach across the region’s vast farm fields and into the living rooms of small town America, tempting tens of thousands to come to the city and see what they could only hear through the ether. In the 1920s, teams that did broadcast games on the radio usually charged nothing for the rights, settling for free promotion of their on-field product. For Wrigley, who was accustomed to paying retail rates to advertise his chewing gum, the prospect of two hours of free advertising for his Chicago Cubs (over as many as five Chicago radio stations) was generous enough compensation. But the anti-radio owners, led by the three New York clubs (the Yankees, Giants and Dodgers), wanted to deny Wrigley his two-hour Cubs commercial. Although he jealously guarded his control over World Series radio rights, MLB Commissioner Kenesaw Mountain Landis believed local radio rights were a league matter and left the decision to broadcast regular season games to the owners. At several NL and AL owners meetings in the late 1920s and early 1930s, the anti-radio forces proposed a league-wide ban on local broadcasts of regular season games. Pro-radio clubs, led by Cubs’ President Bill Veeck, Sr, were adamant that the choice to broadcast belonged to his club. It was no more of concern to other clubs, he argued, than the decision whether or not to sell peanuts to the fans in the stands. But to teams like the St Louis Cardinals, it was a concern: because the Cubs’ radio waves reached the Cardinals’ fan base, they were convinced that the broadcasts negatively influenced their own attendance numbers. The decision of whether or not to broadcast games, they reasoned, was not the Cubs alone to make. What finally won over the Cardinals – and enough of the owners to prevent the passage of a league-wide radio ban – was the classic “slippery slope” argument: if the League could dictate radio rights, what other team rights might be at stake? To them, team autonomy was paramount. From there, the best the anti-radio forces could muster was a tie vote at the 1934 American League meeting; team control over its media rights was codified by the slimmest of margins. The matter appeared settled: pro-radio teams would continue to exploit the medium and anti-radio barons would limit coverage to the home opener and a handful of other games. General Mills also sponsored training conferences to professionalize baseball, announcing and offered prizes to announcers who did the best job of increasing the home gate. But mighty as it was, General Mills was initially frozen out of the nation’s biggest baseball market. In 1932, the three New York clubs had agreed to ban local broadcasts for five years. The teams had little regular local coverage and even restricted broadcasts from visiting teams back to their home cities. Undaunted, General Mills began sponsoring re-creations of Boston and Philadelphia home games on New York’s WMCA, opening up the New York market without the consent of the Yankees, Giants or Dodgers. While not as popular as their local teams’ games might be, New York listeners finally were finally receiving a regular dose of MLB play. Pressure on anti-radio teams to broadcast was growing in other markets. 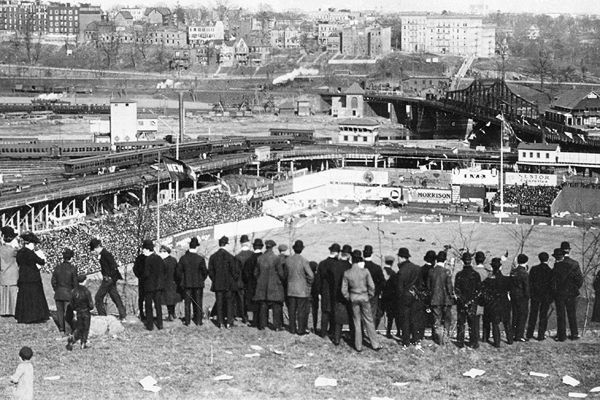 In Pittsburgh, stations were re-creating games without consent of the local team, using observers at the park, or monitoring other broadcasts. Owners now realized their property rights were at stake: if they didn’t meet the public’s demand for daily baseball broadcasts, others would. The owners began to cooperate, sharing information on the value of their local broadcasts rights. In 1937, Leo Bondy of the New York Giants shocked NL owners by reporting that his team turned down $100,000 for the rights to broadcast home games. Soon, owners realized that baseball on the radio was more than promotion: it could generate some serious cash. To protect their increasingly valuable rights, owners took on broadcast bootleggers in federal court. In 1938, the Pittsburgh Pirates successfully sued local station KQV, which had been pirating the team’s broadcasts. The court’s decision solidified the ownership of broadcast rights of local teams, opening the door to billions in future media rights revenues. In 1939, after the New York teams’ five-year ban expired, the Dodgers brought famed broadcaster Red Barber from Cincinnati to Brooklyn. The city quickly embraced the talented Barber. The Yankees and Giants followed suit, also allowing home broadcasts in 1939. The 20-year conflict over radio was over. The two were now joined in an increasingly profitable partnership – one that, with the advent of TV, would go on to reap billions. This article is based on material in Crack of the Bat: A History of Baseball on the Radio (University of Nebraska Press, 2015).